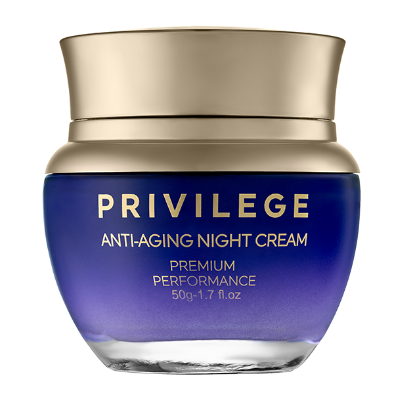 Природная сила ночного крема Privilege Anti-Aging Night восстанавливает кожу, пока вы спите, наполняя её мощнейшим комплексом натуральных компонентов. Утром ваша кожа мягкая и отдохнувшая, готовая сиять весь день. Состав: Aloe Barbadensis Leaf Juice, Caprylic/Capric Triglyceride, Glycerin, Simmondsia Chinensis (Jojoba) Seed Oil, Stearic Acid, Soluble Collagen, Water, Dimethicone, Sorbitan Stearate, Phenoxyethanol, Carbomer, Cetyl Alcohol, Triethanolamine, Glyceryl Stearate, PEG-100 Stearate, Fragrance/Parfum, Panthenol, Squalane, Caprylyl Glycol, 3-O-Ethyl Ascorbic Acid, Ethylhexylglycerin, Hexylene Glycol, Allantoin, Cyanocobalamin, Coffea Robusta Seed Extract, Tocopheryl Acetate, Retinyl Palmitate, Leuconostoc/Radish Root Ferment Filtrate, Euterpe Oleracea Pulp Powder, Myristyl Alcohol, Stearyl Alcohol, Anthemis Nobilis Flower Extract, Laminaria Digitata Extract, Sodium Hyaluronate, Potassium Sorbate, Tocopherol, Acetyl Hexapeptide-8, Trisodium EDTA. Privilege крем для лица и шеи омолаживающий дневной.